THE RECENT SURGE in power of a Sunni jihadist force in northwest Iraq has been spectacular. But Prime Minister Nouri al-Maliki’s protestations of shock and horror are both theatrical and disingenuous, for it was his own actions that paved the way for this surge. His friends, especially those in Iran, know this but are playing along for their own reasons: it provides a welcome way of distracting people from Maliki’s own failures. In June, Sunni jihadists acting in the name of the Islamic State in Iraq and the Levant (ISIL, also known as ISIS) seized Mosul, Iraq’s second city, almost without a struggle. Other places in this Sunni-dominated zone fell rapidly, as the security apparatus collapsed, abandoning weapons (including US-supplied vehicles) and leaving behind many prisoners as well as spoils, including nearly half a billion dollars at a branch of Iraq’s central bank. Less radical armed groups joined the movement, probably exaggerating their role in the victories. Some inhabitants who hadn’t fled celebrated a “liberation”, “uprising” or “revolution”. The Kurds seized their chance to take control of Kirkuk (see The Kurds’ big gains,), in a region rich in oil and cultural symbolism. Its control had for several years been a source of heated dispute with the Baghdad government and other local minorities. This other conquest has gone almost unremarked: all the attention has been on the jihadists. If you believe Nouri al-Maliki, his Shia allies and rivals, the US administration and much of the media, the jihadist offensive was impossible to resist: they have also voiced fears that the jihadists might seize and destroy the Shia mausoleums at Samarra, provoking a new intra-faith war, or conquer Baghdad and establish a caliphate across much of Iraq and Syria (as announced on 30 June). Maliki called for a general mobilisation of his support base. A variety of faith-based militias, whose expansion he has tolerated, and several prominent Shia figures have heeded the call. Iran dispatched reinforcements to organise these paramilitary groups and probably fight alongside them. The US redirected two aircraft carriers near a theatre of operations that President Obama has been trying to leave since 2011. Maliki’s political strategy — and his image — changed radically in 2008, when the US helped him to get out of a sectarian straightjacket. Sunni militias were co-opted by the government to fight Al-Qaida and to rein in out-of-control Shia militias. Maliki’s own role was minimal, but it gave him a statesmanlike aura, as though he had risen above the dynamics of the civil war and was leading the country back to stability. He continued to portray himself as the nation’s saviour and developed a personality cult that owed much to Saddam Hussein. This didn’t seem to worry his Shia supporters. Whether because of the suffering under the previous regime or the “ungovernability” of the Iraqi people, the Shia wished for nothing better than the emergence of a leader in the Saddam mould, but of their own sect. The fight against “terrorism” quickly became Maliki’s main policy, enabling him to pursue many objectives simultaneously. He concentrated more power in his own hands, expanded his control over the huge security apparatus he had inherited from the US occupying force, and repurposed it for his own political ends. From December 2010 he accumulated the posts of prime minister, commander in chief of the armed forces, defence minister and interior minister. Fear of a power vacuum also helped prevent any attempt to replace him, and guaranteed him the necessary level of support from the US and Iran. Obama had wanted since his election to withdraw US troops as quickly as possible, while Iran was pleased to have Maliki, as a leader capable of holding on to power while taking care not to go against Iran’s interests. Without any such pressure, Maliki has neglected and sometimes dismantled the (often tribal) Sunni militias he inherited from the US, and cultivated a sectarian, corrupt security apparatus. Sunni opposition has been treated as “terrorism”, which has led to arbitrary arrests and detentions, and countless atrocities. Iraq’s Sunnis, inspired by the 2011 uprisings in neighbouring countries, were rebellious over their treatment but at the same time disheartened by the disastrous militarisation of Syria’s opposition, as well as their own painful defeat in the civil war. In 2012 they organised themselves to voice their dissatisfaction peacefully. Early demonstrations turned into permanent sit-ins in the main squares of Iraq’s Sunni cities, the demands always centred on rebalancing the power structure to give Sunnis a full role. Maliki ignored them. He took the gradual return of bombings not as a warning, but as a pretext for a hardline stance (1). So the option of violence, previously seen by the Sunnis as an unacceptable alternative, began to gain support beyond the extremist fringes. It would be wrong to focus too much on the most obvious aspects of the crisis — US responsibility, the personalisation of the problem in Maliki or the threat of “terrorism”. The core problem, less mentioned, is how power is exercised in Iraq, and the nature of its institutions. Nouri al-Maliki’s personality is secondary: he exists in a context that not only allows him to behave as he does, but rewards him for doing so. In March, he organised a big international conference on the “fight against terrorism”; the UN took part and cheered him on. Exercising ever-expanding power means abandoning any ambition to govern a proper nation state. These regimes no longer even try to address the divisions within society, of ideology, development or repression; rather they use the fault lines, and make them worse, to seek conflict. By radicalising one section of society, they consolidate their support in another, and have no need of a positive agenda; fear of the future is enough to keep them in power. They make themselves indispensable by depriving institutions of their autonomy, and therefore of their national character. They promote their regimes abroad in the name of the “war on terror”, backed by “democratic” elections with results that reflect the hysterical support of one section of society — and a boycott by the rest. 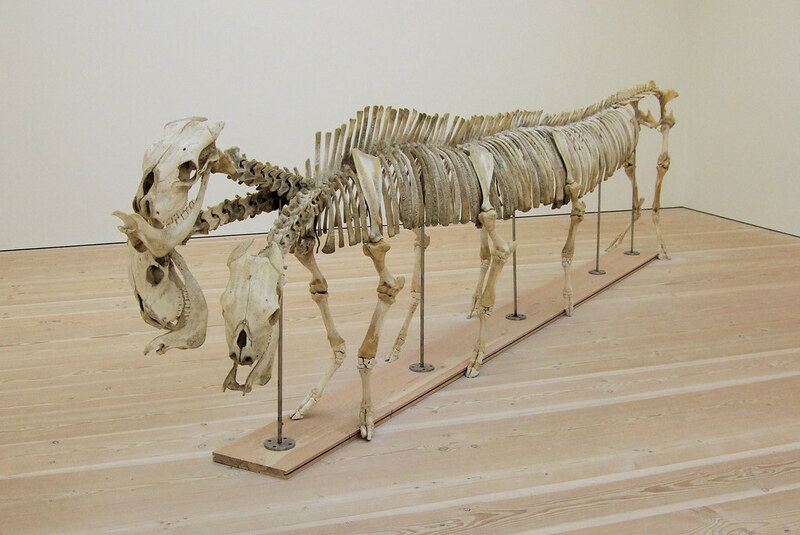 Illustration credit: Shen Shaomin Unknown Creature – Three Headed Monster by Saatchi Gallery / licensed by CC. 1 See Feurat Alani, “Violence and power struggles”, Le Monde diplomatique, English edition, January 2014.